For other uses, see Whaling (disambiguation). "Hunting Whales" redirects here. For the album by The Checks, see Hunting Whales (album). Whaling is the hunting of whales for their usable products such as meat and blubber, which can be turned into a type of oil which became increasingly important in the Industrial Revolution. It was practiced as an organized industry as early as 875 AD. By the 16th century, it had risen to be the principle industry in the coastal regions of Spain and France. The industry spread throughout the world, and became increasingly profitable in terms of trade and resources. Some regions of the world's oceans, along the animals' migration routes, had a particularly dense whale population, and became the targets for large concentrations of whaling ships, and the industry continued to grow well into the 20th century. The depletion of some whale species to near extinction led to the banning of whaling in many countries by 1969, and to a worldwide cessation of whaling as an industry in the late 1980s. The earliest forms of whaling date to at least circa 3000 BC. Coastal communities around the world have long histories of subsistence use of cetaceans, by dolphin drive hunting and by harvesting drift whales. Industrial whaling emerged with organized fleets of whaleships in the 17th century; competitive national whaling industries in the 18th and 19th centuries; and the introduction of factory ships along with the concept of whale harvesting in the first half of the 20th century. By the late 1930s more than 50,000 whales were killed annually. In 1986, the International Whaling Commission (IWC) banned commercial whaling because of the extreme depletion of most of the whale stocks. Contemporary whaling is subject to intense debate. Countries that support commercial whaling, notably Iceland, Japan, and Norway, wish to lift the ban on certain whale stocks for hunting. Anti-whaling countries and environmental groups oppose lifting the ban. Under the terms of the IWC moratorium, aboriginal whaling is allowed to continue on a subsistence basis. Over the past few decades, whale watching has become a significant industry in many parts of the world; in some countries it has replaced whaling, but in a few others, the two business models exist in an uneasy tension. The live capture of cetaceans for display in aquaria (e.g. captive killer whales) continues. Whaling on Danes Island, by Abraham Speeck, 1634. Skokloster Castle. Whaling began in prehistoric times in coastal waters. The earliest depictions of whaling are the Neolithic Bangudae Petroglyphs in Korea, which may date back to 6000 BC. These images are the earliest evidence for whaling. Although prehistoric hunting and gathering is generally considered to have had little ecological impact, early whaling in the Arctic may have altered freshwater ecology. Early whaling affected the development of widely disparate cultures – such as Norway and Japan, both of which continue to hunt in the 21st century. The Basques were the first to catch whales commercially, and dominated the trade for five centuries, spreading to the far corners of the North Atlantic and even reaching the South Atlantic. The development of modern whaling techniques was spurred in the 19th century by the increase in demand for whale oil, sometimes known as "train oil", and in the 20th century by a demand for margarine and later whale meat. Many countries which once had significant industries, such as the Netherlands, Scotland, and Argentina, ceased whaling long ago, and so are not covered in this article. The primary species hunted are minke whales, belugas, narwhals, and pilot whales. which are some of the smallest species of whales. There are also smaller numbers killed of gray whales, sei whales, fin whales, bowhead whales, Bryde's whales, sperm whales and humpback whales. Recent scientific surveys estimate a population of 103,000 minkes in the northeast Atlantic. With respect to the populations of Antarctic minke whales, as of January 2010, the IWC states that it is "unable to provide reliable estimates at the present time" and that a "major review is underway by the Scientific Committee." Whale oil is used little today and modern whaling is primarily done for food: for pets, fur farms, sled dogs and humans, and for making carvings of tusks, teeth and vertebrae. Both meat and blubber (muktuk) are eaten from narwhals, belugas and bowheads. From commercially hunted minkes, meat is eaten by humans or animals, and blubber is rendered down mostly to cheap industrial products such as animal feed or, in Iceland, as a fuel supplement for whaling ships. provide for the proper conservation of whale stocks and thus make possible the orderly development of the whaling industry. The International Whaling Commission (IWC) was set up under the ICRW to decide hunting quotas and other relevant matters based on the findings of its Scientific Committee. Non-member countries are not bound by its regulations and conduct their own management programs. It regulates hunting of 13 species of great whales, and has not reached consensus on whether it may regulate smaller species. The IWC voted on July 23, 1982, to establish a moratorium on commercial whaling of great whales beginning in the 1985–86 season. Since 1992, the IWC's Scientific Committee has requested that it be allowed to give quota proposals for some whale stocks, but this has so far been refused by the Plenary Committee. At the 2010 meeting of the International Whaling Commission in Morocco, representatives of the 88 member states discussed whether or not to lift the 24-year ban on commercial whaling. Japan, Norway and Iceland have urged the organisation to lift the ban. A coalition of anti-whaling nations has offered a compromise plan that would allow these countries to continue whaling, but with smaller catches and under close supervision. Their plan would also completely ban whaling in the Southern Ocean. More than 200 scientists and experts have opposed the compromise proposal for lifting the ban, and have also opposed allowing whaling in the Southern Ocean, which was declared a whale sanctuary in 1994. Opponents of the compromise plan want to see an end to all commercial whaling, but are willing to allow subsistence-level catches by indigenous peoples. These totals include great whales: counts from IWC and WDC and IWC Summary Catch Database version 6.1, July 2016. The IWC database is supplemented by Faroese catches of pilot whales, Greenland's and Canada's catches of narwhals (data 1954-2014), belugas from multiple sources shown in the Beluga whale article, Indonesia's catches of sperm whales, and bycatch in Korea. Key elements of the debate over whaling include sustainability, ownership, national sovereignty, cetacean intelligence, suffering during hunting, health risks, the value of 'lethal sampling' to establish catch quotas, the value of controlling whales' impact on fish stocks and the rapidly approaching extinction of a few whale species. The World Wide Fund for Nature says that 90% of all northern right whales killed by human activities are from ship collision, calling for restrictions on the movement of shipping in certain areas. Noise pollution threatens the existence of cetaceans. Large ships and boats make a tremendous amount of noise that falls into the same frequency range of many whales. By-catch also kills more animals than hunting. Some scientists believe pollution to be a factor. Moreover, since the IWC moratorium, there have been several instances of illegal whale hunting by IWC nations. In 1994, the IWC reported evidence from genetic testing of whale meat and blubber for sale on the open market in Japan in 1993. In addition to the legally permitted minke whale, the analyses showed that the 10–25% tissues sample came from non minke, baleen whales, neither of which were then allowed under IWC rules. Further research in 1995 and 1996 shows significant drop of non-minke baleen whales sample to 2.5%. In a separate paper, Baker stated that "many of these animals certainly represent a bycatch (incidental entrapment in fishing gear)" and stated that DNA monitoring of whale meat is required to adequately track whale products. It was revealed in 1994 that the Soviet Union had been systematically undercounting its catch. For example, from 1948 to 1973, the Soviet Union caught 48,477 humpback whales rather than the 2,710 it officially reported to the IWC. On the basis of this new information, the IWC stated that it would have to rewrite its catch figures for the last forty years. According to Ray Gambell, then Secretary of the IWC, the organization had raised its suspicions with the former Soviet Union, but it did not take further action because it could not interfere with national sovereignty. Whaling was a major maritime industry in Australia from 1791 until its final cessation in 1978. At least 45 whaling stations operated in Tasmania during the 19th century and bay whaling was conducted out of a number of other mainland centres. Modern whaling using harpoon guns and iron hulled catchers was conducted in the twentieth century from shore-based stations in Western Australia, New South Wales and Queensland, also in Norfolk Island. Overfishing saw the closure of some whaling stations before a government ban on the industry was introduced in 1978. Canadians kill about 600 narwhals per year. They kill 100 belugas per year in the Beaufort Sea, 300 in northern Quebec (Nunavik), and an unknown number in Nunavut. The total annual kill in Beaufort and Quebec areas varies between 300 and 400 belugas per year. Numbers are not available for Nunavut since 2003, when the Arviat area, with about half Nunavut's hunters, killed 200-300 belugas, though the authors say hunters resist giving complete numbers. Harvested meat is sold through shops and supermarkets in northern communities where whale meat is a component of the traditional diet. Hunters in Hudson's Bay rarely eat beluga meat. They give a little to dogs, and leave the rest for wild animals. Other areas may dry the meat for later consumption by humans. An average of one or two vertebrae and one or two teeth per beluga or narwhal are carved and sold. One estimate of the annual gross value received from Beluga hunts in Hudson Bay in 2013 was CA$600,000 for 190 belugas, or CA$3,000 per beluga, andCA$530,000 for 81 narwhals, or CA$6,500 per narwhal. However the net income, after subtracting costs in time and equipment, was a loss of CA$60 per person for belugas and CA$7 per person for narwhals. Hunts receive subsidies, but they continue as a tradition, rather than for the money, and the economic analysis noted that whale watching may be an alternate revenue source. Of the gross income, CA$550,000 was for Beluga skin and meat, to replace beef, pork and chickens which would otherwise be bought, CA$50,000 was received for carved vertebrae and teeth. CA$370,000 was for Narwhal skin and meat, CA$150,000 was received for tusks, and carved vertebrae and teeth of males, and CA$10,000 was received for carved vertebrae and teeth of female Narwhals. "Canada has pursued a policy of marine mammal management which appears to be more to do with political expediency rather than conservation." Canada left the IWC in 1982, and the only IWC-regulated species currently harvested by the Canadian Inuit is the bowhead whale. As of 2004, the limit on bowhead whale hunting allows for the hunt of one whale every two years from the Hudson Bay-Foxe Basin population, and one whale every 13 years from the Baffin Bay-Davis Strait population. This is roughly one-fiftieth of the bowhead whale harvest limits in Alaska (see below). The Faroe Islands are legally part of the Kingdom of Denmark, but are geographically isolated and cultually distinct. The hunt, known as the Grindadráp, is regulated by Faroese authorities but not by the IWC, which does not claim jurisdiction over small cetaceans. Around 800 long-finned pilot whales (Globicephala melaena) are caught each year, mainly during the summer. Other species are not hunted, though occasionally Atlantic white-sided dolphin can be found among the pilot whales. Most Faroese consider the hunt an important part of their culture and history and arguments about the topic raise strong emotions. Animal-rights groups criticize the hunt as being cruel and unnecessary and economically insignificant. Hunters claim that most journalists lack knowledge of the catch methods used to capture and kill the whales. Greenlandic Inuit whalers catch around 175 large whales per year, mostly minke whales, as well as 360 narwhals, 200 belugas, 190 pilot whales and 2,300 porpoises. IWC sets limits for large whales. The government of Greenland sets limits for narwhals and belugas. There are no limits on pilot whales and porpoises. The IWC treats the west and east coasts of Greenland as two separate population areas and sets separate quotas for each coast. The far more densely populated west coast accounts for over 90 percent of the catch. The average per year from 2012-2016 was around 150 minke and 17 fin whales and humpback whales taken from west coast waters and around 10 minke from east coast waters. In April 2009 Greenland landed its first bowhead whale in nearly forty years. It landed three bowheads each year in 2009 and 2010, one each in 2011 and 2015. The Inuit already caught whales around Greenland since the years 1200–1300. They mastered the art of whaling around the year 1000 in the Bering Strait. The technique consists of spearing a whale with a spear connected to an inflated seal bladder. The bladder would float and exhaust the whale when diving, and when it surfaces; the Inuit hunters would spear it again, further exhausting the animal until they were able to kill it. Vikings on Greenland also ate whale meat, but archaeologists believe they never hunted them on sea. Being originally one of the most successful whaling nations, German whaling vessels started from Hamburg and other, smaller cities on the Elbe river, hunting for whales around Greenland and Spitsbergen. While 1770 is recorded to have been the most successful year of German whaling, German whaling went into steep decline with the beginning of the Napoleonic Wars and never really recovered. After the Napoleonic Wars, Germany tried but could never re-establish a successful whaling industry. German whaling boats in the mid to late 1800s would generally not be staffed with experienced sailors but rather with members of more wealthy farming communities, going for short trips to Scandinavia during the end of spring / beginning of summer, when their labor was not required on the fields. This kind of whaling was ineffective. Many journeys would not lead to any whales caught, instead seal- and polar bear skins were brought back to shore. Communities often paid more for equipping the vessels in the first place than making money with the goods brought back to shore. Today, local historians believe that German whaling in the late 1800s was more a rite of passage for the sons of wealthy farmers from northern German islands than an action undertaken for true commercial reason. German whaling was abandoned in 1872. Prior to the first world war, attempts to re-establish large scale German whaling were undertaken with ships either going from Germany to Iceland or from the newly established German colonies to African waters. This attempts never were commercially successful and quickly given up. Only in the 1930s Germany could - with mainly Norwegian personnel - re-establish a large and successful whaling industry with more than 15 000 caught whales between 1930 and 1939. With the beginning of the second world war, German whaling was abandoned completely. In the early 1950s, Germany maintained one whaling vessel for testing purpose as it considered re-establishing a German whaling fleet, but abandoned these plans in 1956. The last remaining German whalers worked for Dutch vessels in the 1950s and 1960s. Iceland is one of a handful of countries that still maintain a whaling fleet. One company concentrates on hunting fin whales, largely for export to Japan, while the only other one hunts minke whales for domestic consumption, as the meat is popular with tourists. Iceland now has its own whale watching sector, which exists in uneasy tension with the whaling industry. Iceland did not object to the 1986 IWC moratorium. Between 1986 and 1989 around 60 animals per year were taken under a scientific permit. However, under strong pressure from anti-whaling countries, who viewed scientific whaling as a circumvention of the moratorium, Iceland ceased whaling in 1989. Following the IWC's 1991 refusal to accept its Scientific Committee's recommendation to allow sustainable commercial whaling, Iceland left the IWC in 1992. Iceland rejoined the IWC in 2002 with a reservation to the moratorium. Iceland presented a feasibility study to the 2003 IWC meeting for catches in 2003 and 2004. The primary aim of the study was to deepen the understanding of fish–whale interactions. Amid disagreement within the IWC Scientific Committee about the value of the research and its relevance to IWC objectives, no decision on the proposal was reached. However, under the terms of the convention the Icelandic government issued permits for a scientific catch. In 2003 Iceland resumed scientific whaling which continued in 2004 and 2005. Iceland resumed commercial whaling in 2006. Its annual quota was 30 minke whales (out of an estimated 174,000 animals in the central and north-eastern North Atlantic) and nine fin whales (out of an estimated 30,000 animals in the central and north-eastern North Atlantic). For the 2012 commercial whaling season, starting in April and lasting six months, the quota was set to 216 minke whales, of which 52 were caught. Lamalera, on the south coast of the island of Lembata, and Lamakera on neighbouring Solor, are the two remaining Indonesian whaling communities. The hunters obey religious taboos that ensure that they use every part of the animal. About half of the catch is kept in the village; the rest is bartered in local markets. In 1973, the United Nations's Food and Agriculture Organization (FAO) sent a whaling ship and a Norwegian whaler to modernize their hunt. This effort lasted three years, and was not successful. According to the FAO report, the Lamalerans "have evolved a method of whaling which suits their natural resources, cultural tenets and style." Lamalerans say they returned the ship because they immediately caught five sperm whales, too many to butcher and eat without refrigeration. Since these communities only hunt whales for noncommercial purposes, it is categorized as 'aboriginal subsistence hunters' by International Whaling Commission (IWC). The Lamalerans hunt for several species of whales but catching sperm whales are preferable, while other whales, such as baleen whales, are considered taboo to hunt. They caught five sperm whales in 1973, about 40 per year in the 1960s and mid 1990s, 13 total from 2002-2006, 39 in 2007, an average of 20 per year through 2014, and 3 in 2015. Traditional Lamaleran whaling used wooden fishing boats built by a group of local craftsmen clan called ata molã and the fishermen will mourn the "death" of their ships for two months. These days, the Lamalerans use motor engine to power their boats; however, their tradition dictates that once a whale has been caught, fishermen will have to row their boats and the whale back to the shore. The traditional practices made whaling a dangerous hunt. In one case, a boat was pulled approximately 120 km away towards Timor (see Nantucket sleighride), while in another case, the hunted whale capsized the boat and forced the fishermen to swim for 12 hours back to the shore. When the commercial whaling moratorium was introduced by the IWC in 1982, Japan lodged an official objection. However, in response to US threats to cut Japan's fishing quota in US territorial waters under the terms of the Packwood-Magnuson Amendment, Japan withdrew its objection in 1987. According to the BBC, America went back on this promise, effectively destroying the deal. Since Japan could not resume commercial whaling, it began whaling on a purported scientific-research basis. Australia, Greenpeace, the Sea Shepherd Conservation Society and other groups dispute the Japanese claim of research “as a disguise for commercial whaling, which is banned.” The Sea Shepherd Conservation Society has attempted to disrupt Japanese whaling in the Antarctic since 2003. The stated purpose of the research program is to establish the size and dynamics of whale populations. The Japanese government wishes to resume whaling in a sustainable manner under the oversight of the IWC, both for whale products (meat, etc.) and to help preserve fishing resources by culling whales. Anti-whaling organizations claim that the research program is a front for commercial whaling, that the sample size is needlessly large and that equivalent information can be obtained by non-lethal means, for example by studying samples of whale tissue (such as skin) or feces. The Japanese government sponsored Institute of Cetacean Research (ICR), which conducts the research, disagrees, stating that the information obtainable from tissue and/or feces samples is insufficient and that the sample size is necessary in order to be representative. The reason for the moratorium [on commercial whaling] was scientific uncertainty about the number of whales. ... It was a moratorium for the sake of collecting data and that is why we started scientific whaling. We were asked to collect more data. This collusive relationship between the whaling industry and the Japanese government is sometimes criticized by pro-whaling activists who support local, small-scale coastal whaling such as the Taiji dolphin drive hunt. Norway registered an objection to the International Whaling Commission moratorium and is thus not bound by it. Commercial whaling ceased for a five-year period to allow a small scientific catch for gauging the stock's sustainability and resumed 1993. Minke whales are the only legally hunted species. Catches have fluctuated between 487 animals in 2000 to 592 in 2007. For the year 2011 the quota is set at 1,286 minke whales. The catch is made solely from the Northeast Atlantic minke whale population, which is estimated at 102,000. Whaling in the Philippines has been illegal since 1997 since the Fisheries Administrative Order 185 of 1991 was amended. The order initially only made illegal the catching, selling, or transporting of dolphins but the 1997 ammendment widened the scope of the ban to include all Cetaceans including whales. The calls for ban on whaling and dolphin hunting in the Philippines were raised by both domestic and international groups after local whaling and dolphin hunting traditions of residents of Pamilacan in Bohol were featured in newspapers in the 1990s. As compromise for residents of Pamilacan who were dependent on whaling and dolphin hunting, whale and dolphin watching is being promoted in the island as a source of tourism income. Despite the ban, it is believed that the whaling industry in the Philippines did not cease to exist but went underground. Russia had a significant whaling hunt of orcas and dolphins along with Iceland and Japan. The Soviet Union's harvest of over 534,000 whales between the 1960s and the 1970s has been called one of the most senseless environmental crimes of the 20th century. In 1970, a study published by Bigg M.A. following photographic recognition of orcas found a significant difference in the suspected ages of whale populations and their actual ages. Following this evidence, the Soviet Union and then Russia continued a scientific whale hunt, though the verisimilitude of the intentions of the hunt over the last 40 years are questioned. The Soviet Union's intensive whaling from 1948 to 1972 was controlled and managed by the central government. In Soviet society, whaling was perceived to be a glamorous and well-paid job. Whalers were esteemed as well-traveled adventurers, and their return to land was often celebrated elaborately such as with fanfare and parades. In regard to economics, the Soviet Union transformed from a "rural economy into an industrial giant" by disregarding the sustainability of a resource to fill high production targets. The government had controlled all industries, including fisheries, and whaling was not constrained by the need for sustainability through profits. Managers' and workers' production was incentivized with salary bonuses of 25%-60% and various other benefits, awards, and privileges. Many industries, whaling included, became a “manic numbers game”. Currently, Russians in Chukotka Autonomous Okrug in the Russian Far East are permitted under IWC regulation to take up to 140 gray whales from the North-East Pacific population each year. About 40 beluga whales are caught in the Sea of Okhotsk each year. There are no recent data on catches in the Arctic Ocean or Bering Sea, where about 60 belugas per year were caught in the early 1980s. Natives of Saint Vincent and the Grenadines on the island of Bequia have a quota from the International Whaling Commission of up to four humpback whales per year using traditional hunting methods and equipment. In early July 2012, during IWC discussions in Panama, South Korea said it would undertake scientific whaling as allowed despite the global moratorium on whaling. South Korea's envoy to the summit, Kang Joon-Suk, said that consumption of whale meat "dates back to historical times" and that there had been an increase in the minke whale population since the ban took place in 1986. "Legal whaling has been strictly banned and subject to strong punishments, though the 26 years have been painful and frustrating for the people who have been traditionally taking whales for food." He said that South Korea would undertake whaling in its own waters. New Zealand's Commissioner Gerard van Bohemen accused South Korea of putting the whale population at risk. He also cited Japan as having not contributed to science for several years despite undertaking scientific whaling. New Zealand's stated position may be seen by its media as less solid than Australia's on the matter given that its indigenous people are pushing forward with plans, unopposed by the government, to recommence whaling there. The people of Ulsan have also traditionally and contemporarily eaten whale meat. South Korea's representative at the IWC said that "this is not a forum for moral debate. This is a forum for legal debate. As a responsible member of the commission we do not accept any such categorical, absolute proposition that whales should not be killed or caught." In the United States, beluga whaling is widely carried out, catching about 300 belugas per year, monitored by the Alaska Beluga Whale Committee. The annual catch ranges between 250-600 per year. 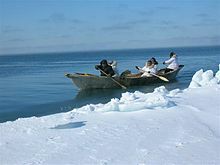 Subsistence hunting of the bowhead whale is carried out by nine different indigenous Alaskan communities, and is managed by the Alaska Eskimo Whaling Commission which reports to the National Oceanic and Atmospheric Administration. The hunt takes around 50 bowhead whales a year from a population of about 10,500 in Alaskan waters. Conservationists fear this hunt is not sustainable, though the IWC Scientific Committee, the same group that provided the above population estimate, projects a population growth of 3.2% per year. The hunt also took an average of one or two gray whales each year until 1996. The quota was reduced to zero in that year due to sustainability concerns. A future review may result in the gray whale hunt being resumed. Bowhead whales weigh approximately 5–10 times as much as minke whales. The Makah tribe in Washington State also reinstated whaling in 1999, despite protests from animal rights groups. They are currently[when?] seeking to resume whaling of the gray whale, a right recognized in the Treaty of Neah Bay, within limits (Article 4 of the Treaty). All catches in 2003–2007 were bowhead whales. ^ "whaling". Britannica Online Encyclopedia. 2001. Retrieved May 16, 2010. ^ Francis, Daniel. "Whaling". The Canadian Encyclopedia. Historica Dominion Institute. Retrieved May 16, 2010. ^ ABC News. "Japan, Norway Move to End Whaling Ban". ABC News. ^ "Aboriginal substance whaling". About Whales and Dolphins. Retrieved 24 February 2016. ^ Roman, Joe (2006-05-01). Whale. Reaktion Books. p. 24. ISBN 9781861895059. Retrieved 25 March 2017. ^ Mannino, Marcello A.; Talamo, Sahra; Tagliacozzo, Antonio; Fiore, Ivana; Nehlich, Olaf; Piperno, Marcello; Tusa, Sebastiano; Collina, Carmine; Salvo, Rosaria Di; Schimmenti, Vittoria; Richards, Michael P. (17 November 2015). "Climate-driven environmental changes around 8,200 years ago favoured increases in cetacean strandings and Mediterranean hunter-gatherers exploited them". Scientific Reports. 5: 16288. doi:10.1038/srep16288. PMC 4648091. PMID 26573384. Retrieved 25 March 2017. ^ Douglas, M. S. V.; Smol, J. P.; Savelle, J. M.; Blais, J. M. (2004). "Prehistoric Inuit whalers affected Arctic freshwater ecosystems". Proceedings of the National Academy of Sciences of the United States of America. 101 (6): 1613–1617. doi:10.1073/pnas.0307570100. PMC 341790. PMID 14745043. ^ Matera, Anthony. "Whale quotas: A market-based solution to the whaling controversy" Archived 2015-10-16 at the Wayback Machine, Georgetown International Environmental Law Review. Fall 2000. ^ "From Old Dartmouth to New Bedford, Whaling Metropolis of the World Whaling should be stopped!". Old Dartmouth Historical Society. Archived from the original on April 30, 2009. Retrieved 2008-12-14. ^ "Total Catches". iwc.int. Retrieved 2018-04-08. ^ a b c Witting, Lars (2017-04-10). "Meta population modelling of narwhals in East Canada and West Greenland - 2017". BioRxiv: 059691. doi:10.1101/059691. ^ Mark Tandy. "Population Estimates". Iwcoffice.org. Retrieved 2010-07-10. ^ "Whale Oil". Petroleumhistory.org. Retrieved 2010-07-10. ^ The Convention. Iwcoffice.org. Retrieved on 2011-10-11. ^ "Small cetaceans". iwc.int. Retrieved 2018-04-08. ^ a b David Jolly (June 21, 2010). "Under Pressure, Commission Discusses Lifting Whaling Ban". The New York Times. ^ Jøn, A. Asbjørn (2014). "The whale road: Transitioning from spiritual links, to whaling, to whale watching in Aotearoa New Zealand". Australian Folklore: A Yearly Journal of Folklore Studies (29): 87–116. ^ "Whaling ban must stay, say 200 scientists". AFP. June 22, 2010. Archived from the original on June 25, 2010. ^ "Total Catches". iwc.int. Retrieved 2018-11-19. ^ "Whaling in Numbers". WDC, Whale and Dolphin Conservation. November 2017. Retrieved 2018-11-27. ^ "IWCDBv6.1". IWC. July 2016. Retrieved 2018-12-22. ^ Zoological Department, Museum of Natural History (2008-06-12). "Whaling Information". Faroe islands Department of Foreign Affairs. Retrieved 2018-12-22. ^ Wittig, Lars (2016-06-18). "Meta population modelling of narwhals in East Canada and West Greenland - 2017" (PDF). bioRxiv, Report submitted as supporting document to the Canada National Marine Mammal Peer Review Committee. Canada National Marine Mammal Peer Review Committee, Winnipeg, Canada. ^ Broadhead, Ivan (2008-03-08). "In for the kill, last of the ancient whalers". The Sydney Morning Herald. Retrieved 2018-12-22. ^ Burnet, Ian (2015-10-23). "The Whale Hunters of Lamalera". spiceislandsblog. Retrieved 2018-12-22. ^ "Threats To Whales". SAVE the WHALES. Retrieved 2013-11-14. ^ "WWF – Impact of shipping on whales". Panda.org. 2010-02-22. Retrieved 2010-07-10. ^ Kirby, Alex. Right whales face extinction. BBC News. June 27, 2000. ^ Baker, C. S.; Palumbi, S. R. (1994). "Which Whales are Hunted? A Molecular Genetic Approach to Monitoring Whaling". Science. 265 (5178): 1538–1539. doi:10.1126/science.265.5178.1538. PMID 17801528. ^ Palumbi, S. R.; Cipriano, F. (1998). "Species identification using genetic tools: The value of nuclear and mitochondrial gene sequences in whale conservation" (PDF). Journal of Heredity. 89 (5): 459–464. doi:10.1093/jhered/89.5.459. PMID 9768497. Retrieved 2006-12-03. ^ Clapham, P. J. & Baker, C. S. (2002). "Modern Whaling" (PDF). Archived from the original (PDF) on 2006-11-08. Retrieved 2006-12-03. ^ Angier, Natalie (1994-09-13). "DNA Tests Find Meat of Endangered Whales for Sale in Japan". The New York Times. Retrieved 2014-08-25. ^ Hearst, David (1994-02-12). "Soviet Files Hid Systematic Slaughter of World Whale Herds". Gazette (Montreal). ^ Williams, David (1994-02-23). "We Didn't Know About the Whale Slaughter". Agence Fr. Presse. ^ a b Muto, M.M., V. T. Helker, R. P. Angliss, B. A. Allen, P. L. Boveng, J.M. Breiwick, M. F. Cameron, P. J. Clapham, S. P. Dahle, M. E. Dahlheim, B. S. Fadely, M.C. Ferguson, L. W. Fritz, R. C. Hobbs, Y. V. Ivashchenko, A. S. Kennedy, J.M. London, S. A. Mizroch, R. R. Ream, E. L. Richmond, K. E. W. Shelden, R. G. Towell, P. R. Wade, J. M. Waite, and A. N. Zerbini (2017). "Alaska Marine Mammal Stock Assessments, 2017 (draft)". Marine Mammal Laboratory, Alaska Fisheries Science Center, NMFS, NOAA. Retrieved 2018-04-08. ^ Fisheries, NOAA (2018-01-31). "Draft Marine Mammal Stock Assessment Reports, NOAA Fisheries". www.fisheries.noaa.gov. Retrieved 2018-04-08. ^ Rogers, Sarah (2016-08-22). "Nunatsiaq News 2016-08-22: NEWS: Nunavik's beluga season closes early". Nunatsiaq News. Retrieved 2018-04-07. ^ SULUK, THOMAS K., and SHERRIE L. BLAKNEY (2008). "Land Claims and Resistance to the Management of Harvester Activities in Nunavut" (PDF). Arctic. 61: 62–70 – via University of Calgary. ^ Christmas, Dan (2018-06-11). "Senate of Canada - Debates". Senate of Canada. Retrieved 2018-12-01. ^ Sinclair, Murray (2018-05-29). "Senate of Canada - Debates". Senate of Canada. Retrieved 2018-12-01. ^ Fox, Mike (2002-05-24). "The Inuit case for whaling". BBC News. ^ "Study approves limited bowhead whale hunt". Nunatsiaq News. Archived from the original on 2014-11-29. Retrieved 2013-08-07. ^ "Total Catches". iwc.int. Retrieved 2018-03-23. ^ Heide-Jorgensen, M.P. and E. Garde (2017-03-01). "Catch statistics for belugas in Greenland 1862 to 2016" – via NAMMCO/JCNB Joint Working Group on narwhals and belugas, Copenhagen. ^ Heide-Jørgensen, M. P.; Hansen, R. G.; Fossette, S.; Nielsen, N. H.; Borchers, D. L.; Stern, H.; Witting, L. (2017-06-01). "Rebuilding beluga stocks in West Greenland (Supplement Table 1)". Animal Conservation. 20 (3): 282–293. doi:10.1111/acv.12315. ISSN 1469-1795. ^ "Table 12, Catches". Statistics Greenland. Retrieved 2018-03-23. ^ "Administration of Catching and Hunting". Retrieved 2018-03-23. ^ Boffey, Daniel (18 April 2018). "Iceland sets target of 191 kills as country resumes whaling". the Guardian. Retrieved 19 April 2018. ^ Marianne Rasmussen. "7". Whale Watching: Sustainable Tourism and Environmental Management. Cambridge University Press. ^ "Recent Icelandic Proposal on scientific permits". IWC. Retrieved 2007-03-19. ^ a b "Whale Population Estimates". International Whaling Commission. Retrieved 2006-12-03. ^ "Commercial Minke Whaling to Start in April". Iceland Review Online. 1 April 2012. Retrieved 24 July 2012. ^ "Catches taken: under objection or under reservation". International Whaling Commission. Retrieved 2017-03-20. ^ a b c Bruemmer, Fred (2001). "Sea hunters of Lamalera". Natural History. 110 (8): 54–59. ISSN 0028-0712. ^ a b Broadhead, Ivan (2008-03-08). "In for the kill, last of the ancient whalers". Sydney Morning Herald. Retrieved 2018-05-06. ^ a b Brown, Taylor Kate (2015-04-26). "Hunting whales with rowing boats and spears". BBC News. Retrieved 2018-11-08. ^ Burnet, Ian (2015-10-23). "The Whale Hunters of Lamalera". spiceislandsblog. Retrieved 2018-05-06. ^ "Did Greens help kill the whale?". Science/Nature. ^ Larter, Paul (8 February 2008). "Australia condemns bloody killing of whale and calf by Japanese fleet". London: The Sunday Times. ^ "Kyokuyo Joins Maruha to End Whale Meat Sales in Japan". Bloomberg. 30 May 2007. Archived from the original on 9 October 2007. ^ Whaling on trial: Vindication!. Greenpeace.org (2010-12-23). Retrieved on 2011-10-11. ^ "Whaling: The Japanese position". BBC News. 2008-01-15. ^ "Same whale quota as this year". P4.no (2010-12-17). Retrieved on 2011-10-11. ^ a b Acebes, Jo Marie. "Historical whaling in the Philippines: origins of 'indigenous subsistence whaling', mapping whaling grounds and comparison with current known distribution: An HMAP Asia Project Paper" (PDF). Asia-Research-Centre. Retrieved 24 December 2013. ^ Acebes, Jo Marie (6 April 2012). "In the wild: Bohol's dolphins and whales". GMA News. Retrieved 4 January 2014. ^ Homans, Charles (November 12, 2013). "The Most Senseless Environmental Crime of the 20th Century". Pacific Standard. The Miller-McCune Center for Research, Media and Public Policy. Retrieved October 12, 2015. ^ Department of Fisheries and Oceans – Science Archived 2016-03-04 at the Wayback Machine. Dfo-mpo.gc.ca (2011-03-07). Retrieved on 2011-10-11. ^ a b Ivaschenko, Y.V. (March 2014). "Too much is never enough: the cautionary tale of Soviet illegal whaling" (PDF). NOAA. Marine Fisheries Review. Retrieved October 28, 2015. ^ Bettridge, Shannon, Robert L. Brownell Jr., Melissa Andersen Garcia, Rod C. Hobbs, Cheri L. McCarty, Richard D. Methot Jr., Debra L. Palka, Patricia E. Rosel, Kathryn S. Swails, and Barbara L. Taylor (2016-03-01). "Status Review of the Sakhalin Bay-Amur River Beluga Whale (Delphinapterus leucas) under the Marine Mammal Protection Act" (PDF). cites Shpak, Meschersky, Hobbs, Andrews, Glazov, Chelintsev, Kuznetsova, Solovyev, Nazarenko, Michaud, and Mukhametov. 2011. Current status of the Sakhalin-Amur beluga aggregation (The Okhotsk Sea, Russia): sustainability assessment. Report for 2007-2010 stages: Report presented at IUCN Independent Scientific Review Panel, Chicago, March 6-7, 2011 (unpublished). 68p and 5 Appendices. Retrieved 2018-04-07. ^ Burns, John J. and Glenn A. Seaman (1986-11-01). "INVESTIGATIONS OF BELUKHA WHALES IN COASTAL WATERS OF WESTERN AND NORTHERN ALASKA II. BIOLOGY AND ECOLOGY" (PDF). Outer Continental Shelf Environmental Assessment Program. Alaska Department of Fish and Game. ^ Tahana, Yvonne (2012-07-05). "Fight for Maori whaling traditions". The New Zealand Herald. ^ "Defiant South Korea vows 'scientific' whaling". www.aljazeera.com. ^ "S Korean media unfazed by whaling". blogs.aljazeera.com. ^ "In Depth". BBC NEWS. ^ Makah Whale Hunt Archived February 7, 2012, at the Wayback Machine. Nwr.noaa.gov. Retrieved on 2011-10-11. ^ 2007 Chair's report Archived June 26, 2012, at the Wayback Machine. Iwcoffice.org. Retrieved on 2011-10-11. Wikimedia Commons has media related to Whaling. On the Water: Fishing for a Living – Online museum exhibition on maritime history from the Smithsonian's National Museum of American History. This page was last edited on 27 March 2019, at 14:12 (UTC).